The Purple Martin is considered to be America's most wanted bird. The interaction between man and martin dates all the way back to the Native Americans. To this day, the purple martin, with its bubbly personality and gurgling song, is cherished by many that host them. Each spring brings on an excitement that only a purple martin landlord (someone that keeps martins) can experience as they anxiously anticipate the return of their beloved purple martins. For some people acquiring martins can be very easy, while for others, it's very exasperating. For those that are interested, the following overview is intended to help educate potentially new, as well as experienced landlords with what it takes to attract, keep, protect and properly care for a colony of purple martins. With all the new discoveries in the last two decades, hosting purple martins has become a lot more than just sticking a house on a pole and letting the birds do their thing. There is a right way and a wrong way and hopefully some of the differences between the two can be explained here. Myths abound about these beautiful birds and maybe while we're at it, we can dispel a few of those, too. Purple martins are the largest member of the swallow family in North America with the adults being typically 7 1/2" - 8” long and having a wingspan of approximately 12”. The mature adult male's entire body color is a blue-black, (except for a very few white feathers usually 'hidden' directly under the wings next to the body) while the females and sub-adult males are dark on the back with gray undersides. The gurgling and chortling sounds of purple martins are not only very distinctive, but also very pleasant to listen to. Purple martins have a normal lifespan of about 5 to 7 years in the wild however; it's not out of the norm for them to reach 9 or 10 years of age. Banding studies have shown them to reach many more years than that, but that is the exception. Because of the long distances they have to fly during migration, the death rate for martins is high and studies have shown a decline of birds in some areas. This is one more reason we humans need to help this beautiful native bird species by supplying them ‘proper’ housing in which to raise their young. These birds are also protected and therefore, they or their nests may not be harmed in any way. Martins are neo-tropic in nature, (migrate south each year). They nest exclusively here in the North American hemisphere and then after nesting is complete, migrate to South America (Brazil, Argentina and surrounding areas) each fall where they spend the winter months molting and gaining a new set of feathers. There are considered 3 main flyways that martins use. The Baja, (through eastern Mexico), the Louisiana (over the Gulf of Mexico) and the Florida Keys, (up the Keys, Florida and east coast). Purple martins migrate well into Canada each year with a few spots that still have fairly good populations. Scouts (the first birds back) begin arriving in the U.S. in January in the southern region and birds continue arriving well into May, even June in some of the more northern latitudes. Many people don’t consider it spring until the martins have arrived. There are three basic factions of birds that need to be considered when dealing with purple martins. First, there are ASY (After Second Year) birds. These are the 'adult' birds that have been through a year of nesting and are returning for at least a second time. These birds are at least into their third summer of life and are the first birds to return each year and will be in their full adult plumage. It's the first arrivals of these birds each spring that are usually considered scouts and NO, they do not go back south to get the rest of the flock. That's a long time myth because of their nature to disappear for a few days at a time after they first arrive. Next, there are the SY (Second Year) birds. These are the birds that were born the previous summer and are now returning for the first time to nest. They are the teenagers of the martin world and will be sporting the plumage of sub adults and both sexes look somewhat alike. The males will usually have a darker spotted throat, a darker head cap and often, occasional blue-black feathers spotted here and there on the chest. Although not always, these are the birds that usually start new colonies because they haven’t nested anywhere else before. These SY birds typically arrive about 4 - 6 weeks behind the ASY birds. A third faction that might need mentioning are HY (Hatching Year) birds. These are birds that are born during the season and are also known as fledglings and have not made their first migration south yet. When fledglings leave the nest to fly south for the winter, on their return, the majority do not usually return to the site where they were born. Having never nested before, they do not yet have the site fidelity that the older birds have and will look for a site to nest where ever they can. It's these birds that will be returning as SY's. Usually, only about 15% to 20% will return to their natal site. Instead, these SY birds will usually look for a new site to set up housekeeping. This is nature's way of preventing inbreeding. Banding studies have shown that SY birds have been spotted as far as 200 miles away from their natal site. 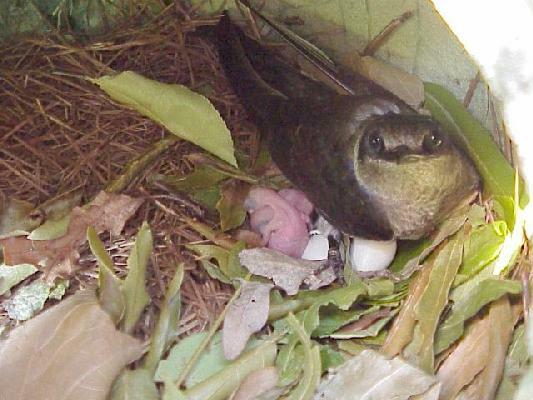 As stated, purple martins nest exclusively here in North America and Canada and rear only one brood of young per year. (Second broods have been reported, but this is the exception). Their eggs are pure white and are laid shortly after nest completion. Nest building begins shortly after a pair has selected a home site. Normally, the males select the cavities and then begin attracting females. The females usually select a mate, not because of him, but because of the cavity he has selected. Although not always, often the same male and female will pair up again if they had breeding success from the previous year and they both survive the migration. A purple martin nest is usually low profile in nature and, depending on the area, will start out with pine straw (dried pine needles) or wheat straw (the stalks of harvested wheat) or whatever is available for that region. Many will even contain small sticks. Both begin the nest but the female usually puts the final touches to it, finishing it to her liking. Because of the difference in latitudes, nesting dates may vary greatly as to the timing, earlier in the south and progressively later in the north. Just before egg laying begins, both birds bring in green leaves to line the nest. Some nests will have an abundance of green leaves while others will only have a few. Although not exactly known why, it’s thought that these are used to keep the eggs moist and possibly keeping parasites away. When the female leaves the nest to feed, she will often cover the eggs with these leaves. Only the female has a brood patch (a patch of bare skin she develops on her chest which she keeps hidden under feathers) and once eggs are laid, she does most of the incubating however, the male will occasionally relieve her for short spells. Depending on the age of the female and the size of the cavity, the female will usually lay anywhere from 3 to 6 pure white eggs with 7 and even 8 eggs being reported, but this is rare. Approximately 16 days after brooding begins, the young will hatch. From this point on, both parents will feed the young with the average time from hatching to fledging being about 28- 32 days. After the young have fledged, they instinctively know how to feed themselves. The young often return to the hatching site for about a week, but will eventually leave permanently to join the adults, returning only occasionally. It's about this time that the parent-fledgling bond is broken and the fledglings are now on their own. When fledging is complete, both adults and fledglings often form large pre-migratory roosts in many areas of the country, preparing to make the trip south. Then, one day something inside their biological clock goes off and so do they, beginning the migration back to South America. Purple martins are found just about everywhere in North America with the exception of the Rocky Mountain States. The western species are a little different than the eastern because of their different nesting habits. In the deserts, they still nest in the wild using available holes in trees and cacti. The northwestern variety also uses some trees along with individual nest boxes supplied by landlords on high poles. However, here in the eastern U. S. and Canada, they have become totally dependent on humans to supply them housing for nesting. Martins are extremely good flyers, averaging about 17-27 miles an hour and obtaining even faster speeds of around 40 if being chased by flying predators. They have extremely well developed wings that seem to let them float on air with little or no effort. These wings have to be well developed in order to carry them from their southern wintering grounds in Brazil all the way into Canada and then back each year. Martins usually fly with a strong wing beat alternating with long glides when not in a hurry, but can achieve higher speeds when necessary. 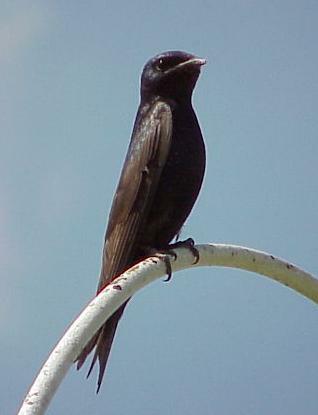 Purple martins eat exclusively flying insects, taking them on the wing. Among the list of many are houseflies, moths and butterflies of all kinds, grasshoppers and their favorite, dragonflies. 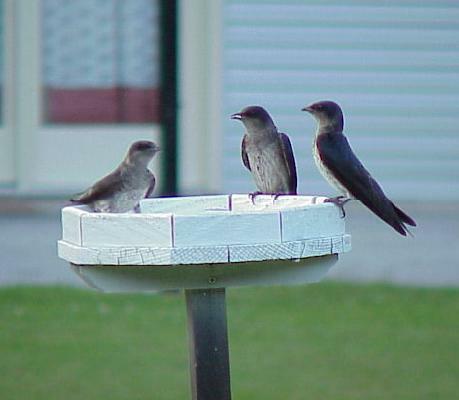 However, one of the major myths about purple martins is that they consume thousands of mosquitoes every day. This myth has been proven false time and again on dietary studies of the stomach contents of martins. Unfortunately this was (and still is) a marketing gimmick used by some commercial house manufacturers to sell their products and it just isn’t true. Yes, martins do eat thousands of insects, but less than 2 - 3% of them are mosquitoes. That same advertising ploy is still used today to dupe the uneducated public into purchasing their products. However, if a person would just stop and think for a minute, they would figure it out on their own. · When do mosquitoes come out… about dark… and when do most birds, (including purple martins) go to bed… about dark. · Mosquitoes hang out near low bushes and shrubbery… martins forage very high in the air… (as high as 300 feet). · Mosquitoes are very small… martins prefer larger prey. The larger the prey, the more energy returned for the energy spent catching it. · The favorite food of purple martins is dragonflies and dragonflies are the mosquitoes ‘foremost’ predator. Dragonflies feed on the larva of mosquitoes, so in reality, it could be said that purple martins actually help the mosquitoes by eating their worst enemy. Another myth is that martins will eat large quantities of Honeybees. This is also a falsehood. Martins may eat one or two of them but the majority of the bees they eat are the drones, simply because they are the only ones that fly that high looking for queens to breed. Normally, worker honeybees, (the females) stay much closer to the ground and don't usually cross paths with the martins. Secondly, the female honeybees have barbed stingers, and if not killed instantly, these stingers could find an occasional soft mouth part. Drones do not have stingers and thus make a less dangerous target. Martins will forage for food when the temperature climbs above 45 deg. They will also eat eggshells and oyster shells, when supplied by the landlord, which provide them with calcium for stronger eggshells. They also feed them to the young as grit to help digest their food. These can be supplied on a small raised platform set on top of a 4 or 5-foot high post. They will quickly find them and don’t be surprised if large quantities are consumed during a nesting season. Martins will not eat from a bird feeder nor will they land and drink from a birdbath (although they have been known to use a large swimming pool). They eat, drink and bathe on the wing and a source of good clean fresh water is a major advantage in attracting them to your home. This could be a small fresh water pond or an open nearby stream. However, if not readily available, they have been known to fly up to 1 or 2 miles for water. They are a very clean bird, taking their fledglings’ excrement and their own, a good distance away from the nesting site. This is done to prevent the draw of unwanted predators to the area. Purple martins are very friendly towards humans. If enough time is spent around their sites, they soon begin to accept the landlord as part of the site and will soon ignore his or her being there entirely. In fact, it is well documented that the more human activity there is near a martin site, the more martins will show up. They are not the least bit afraid of man or his modern conveniences and in fact, they actually seek out sites where there is abundant human activity. Through generations of imprinting, (scientifically known as behavioral pattern shifting), martins have learned that where there are humans, there often aren’t any predators. If worked with close enough, purple martins can almost be ‘tamed’ and getting young children interested in them is also a big plus. There is no age limit on hosting and enjoying martins and if taught properly from an early age, children become very interested in and quickly learn to respect them and there is nothing better than teaching the young to respect nature. And as the colony grows, watching their aerial acrobatics is a joy in itself and a source of amusement and amazement for all that take the time to enjoy them. Fledging time is especially comical because the young are just learning to fly and many times the landings are timed wrong and they have to do it all over again. As stated, purple martins in the eastern portion of the country are now totally dependent on man made housing. Originally, Native Americans discovered that, if they put up hollowed out gourds, martins would use them for nesting. How this was first discovered nobody really knows for sure. They soon noticed that these martins would drive away some pests and predators such as crows and hawks. They also discovered that the martins consumed large quantities of pesky insects thus, the more gourds they put up, the more martins came and the fewer insects were around. Before long the martins learned to move from the trees to the gourds and around humans, a move which became mutually beneficial for both man and martins. Today, many different varieties of housing are available. Many variations of wood, plastic and metal houses, natural and plastic gourds are all used. With today’s mass production capabilities, many new and different types of modern martin houses are available commercially. Unfortunately many of the standards for them are improper and many of these houses are inadequate for martins. In many cases the house compartments are much too small and some of the materials used are much too flimsy. A Great Horned or Barred owl with hungry young to feed will quickly rip the fronts off some of these houses to get at the young and adults inside. Many of these houses are not designed to allow for proper care and maintenance of the house. On many, the front panels are not removable and cleaning out old nests or pest bird nests is next to impossible. In fact, many of these houses shouldn’t even be on the market, but because there are no ‘standards’ for the production of martin housing, just about anybody will try and sell something to make money, regardless of how inadequate it is. And what’s worse, we as humans only look at some of them ergonomically and often purchase them just because they’re cute, when in reality, many of them are terrible houses in which to raise young martins. However, recently some commercial housing manufacturers are beginning to realize this and are making the changes to their products so that the best interests of the martins are being considered and not just their bottom lines. These manufacturers are realizing that if the birds can't nest safely in their houses, then they might soon be out of business. These houses might cost a little bit more to begin with, but are totally worth it in the long run. Because martins are now totally dependent on housing supplied by man, it is imperative that a set of proper standards be developed for these structures if they are to be used for nesting birds. With all the research and testing that's been done of late on this hobby it's now easy to ascertain what is good and what is not for the purple martin as a nester in your site. All housing used for purple martins, regardless of materials and whether it’s commercial or home made, should have a few minimum standard requirements. This only stands to reason. In order for martins to safely raise a brood of young, they need to have the correct housing to do so. 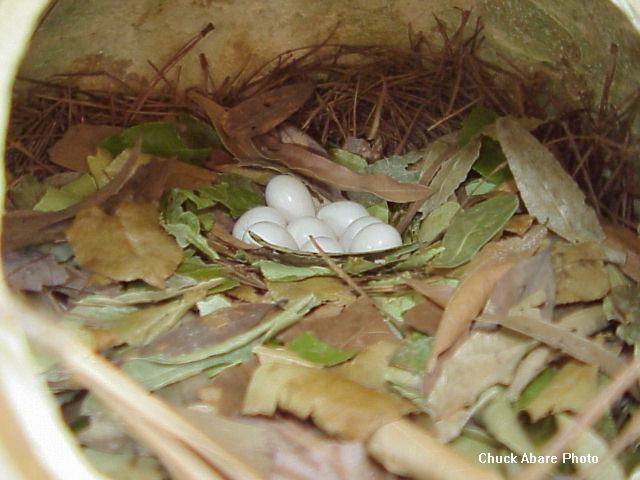 · All housing should be easily accessible for maintenance and nest checks. It should be able to easily be raised and lowered vertically. No housing that tips should ever be used, nor should houses that are solid mounted to the top of a pole. These forms of housing are archaic in nature and should be updated to modern standards. Plus the use of ladders for maintenance brings up safety issues for the humans involved. · Nesting compartments should be a minimum of 6” wide x 9” deep and up to 12" deep is even better. Anything less is too small for martins to properly raise a brood of young and keep well out of the reach of talons of flying predators that often happen by looking for a meal. Houses that do not come with these dimensions or have the capability to change to them should not be purchased or used. · Housing should be painted white to reflect the rays of the sun thus, keeping the house cooler. Research shows that unpainted or dark colored housing, including gourds, are a full 10 - 15 degrees hotter than those painted white. The heat factor is often the cause of young jumping from the nest early on hot days, seeking relief from the heat. · Easy access into the compartments via hinging or removable panels is imperative. The landlord needs to be able to easily get into them to clean out old nests, remove unwanted pest bird nests, perform nest checks and do general maintenance on the housing. The house should have good ventilation. This is an absolute must. A couple of ½” diameter holes placed high in the front and rear walls of the compartments allows for air flow through the compartments and the young birds will need this, especially in the southern regions of their range. This one simple feature in housing greatly improves the chances of the young making it through the hot spells of summer. Because of the introduction of European Starlings into this country, all housing should contain SREH’s, (Starling Resistant Entrance Holes) of some form. There are a number of different styles available, but the crescent option shown below is the easiest to make for the average landlord. The new 1 3/16” high crescents have proven to effectively keep 99% of all starlings out of martin housing while at the same time, allowing martins easy access. Round holes are still used in some parts of the country where starlings are not yet an issue, but for the areas that are plagued by starlings, round holes are no longer a viable option. The drawing here shows the dimensions for the new crescents and they can easily be cut with a jigsaw and fine tuned with a small wood rasp for accuracy. The 1.19 (1 3/16") is very important. Anything larger and the starlings will be able to enter. Also, recent testing information has also shown that any SREH should have 3" x 3" porches, both outside and inside the compartment, located between flush and 1/4" below the bottom of the crescent opening. The reason is that this helps the martins to negotiate these tighter openings, while at the same time, making it much more difficult for the long legged pest birds, such as the European Starling, to get in. 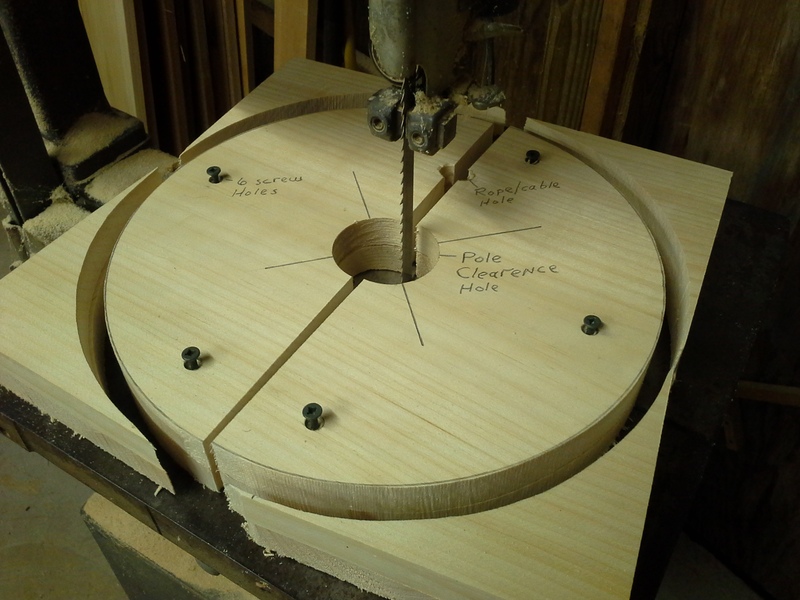 The .25" (1/4") radius in the corners is also important, it helps prevent any wing entrapment when the birds are fighting for their compartments and yes, a lot of fighting goes on in a purple martin colony in defense of their compartments. Once it's decided that you'd like to start a purple martin colony, the first thing to look at is the location. Martins do not like trees close to their nesting sites therefore, if the selected site is heavily wooded, then your chances of attracting martins is very low. Martins just won't come to sites where trees are prevalent. They need very open and unobstructed flight paths to get to their housing and if this is not available, then it should not be considered martin territory. Martin housing should be located as far away from any nearby obstruction as the obstruction is tall. For instance, if you have a 60' tree in your yard then a good starting distance from the tree for the housing would be 60 feet or more. Tall trees harbor ambushing predators such as hawks and having trees taller than the housing in close proximity will afford those predators cover and dropping out of the higher limbs allows them a head start on surprising and ambushing the martins. Martins are instinctively aware of this and therefore, stay away from such situations. The more open the selected site is, the better the chances of attracting them. The same applies for any bushes close to the base of the pole. They too, harbor climbing predators and martins shy away from such sites as well. However, contrary to all rules of nature, purple martins actually like to be close to human housing. As stated earlier, martins actually like to have human activity near their housing and in fact, often pick the nest cavities that face the human housing. Yes, when they first arrive to a site, they will fly off if approached too closely because they don't yet know you. But within a very short time, they get used to the humans and will soon sit right on their housing and not even pay any attention. I personally have mowed the grass directly under my housing and a good many of them won't even bother to fly off. The more time spent around them, the quicker they get used to the human activity and they soon begin to ignore it all. One good thing to do in new housing is supply the compartments with a pre-made bed of nesting material. Martins seem to enjoy this and readily accept these compartments over others that are empty. About an inch of pine straw or wheat straw added to the nesting compartment makes the martins much more interested in it. Add enough to bring the material right up to the bottom of the entrance hole or internal porch if you are using SREH entrance holes. Purple martins have very short legs and this helps greatly in the exiting of the house compartment or gourd. Both pine and wheat straw are available at just a bout any garden shop or co-op and are rather inexpensive. Sawdust or shavings of any kind aren’t a good base for a nest because they're not stable under foot, especially on slick surfaces such as plastic or aluminum and will soak up water, leaving the nest wet. Often, the martins will discard these in favor of more stable materials. Martins will often use small sticks in the building of their nests. Extra nesting materials can be offered, either on a raised platform made just for it, or simply spread out on the ground, (assuming there are no predators around, especially cats). A simple 2' x 2' square platform, placed on top of a pole near the housing, and filled with wheat or pine straw, (cut to about 3" lengths) will soon become the primary source for their nesting material. The martins will use it to top off their nests to their liking. The two worst problems for martins today are the European Starling and the English House Sparrow. Both of these species were introduced into the U. S. in the 1800’s and have propagated to the point that they are extreme pests today and not just for purple martins. Both of these introduced species have taken over many of our own native cavity nesting birds’ homes, leaving them with no places to nest and raise their young. Both are the martins’ worst enemies and both will usurp the martins’ nesting cavities and then vigorously fight the martins off to defend it. Once obtained, they will fill the cavity with nesting material so that the martins will never go into the cavity again. In many cases the original martin tenants will be evicted and the young or eggs destroyed. Often, if a starling can trap an adult martin in its cavity, it will attempt to kill it and often succeeding. The starling will then begin building a nest right over the dead bodies as if they weren’t even there. People that allow either of these two species to nest in their martin housing and then believe that the two species are living in harmony are not very well educated about their birds and are only fooling themselves. Studies have shown that once starlings or sparrows are allowed to nest in a martin house, the existing colony declines and soon disappears. Sparrows are especially difficult to control because one, they are small enough to negotiate any size hole that the martin can get in and two, once they fill one nest cavity with nesting material, they will then proceed to the next and the next and so on around the housing until the martins are evicted. Plus, they are notorious for pinning (poking holes in) the eggs in the unguarded nests, thus rendering those eggs useless and since martins only raise one brood per year, they often simply leave the nest site. If sparrows are nesting in a cavity of a purple martin house, it is certain that it is the English House Sparrow. Native sparrows do not use cavities to nest in, preferring the open limbs of bushes and trees. 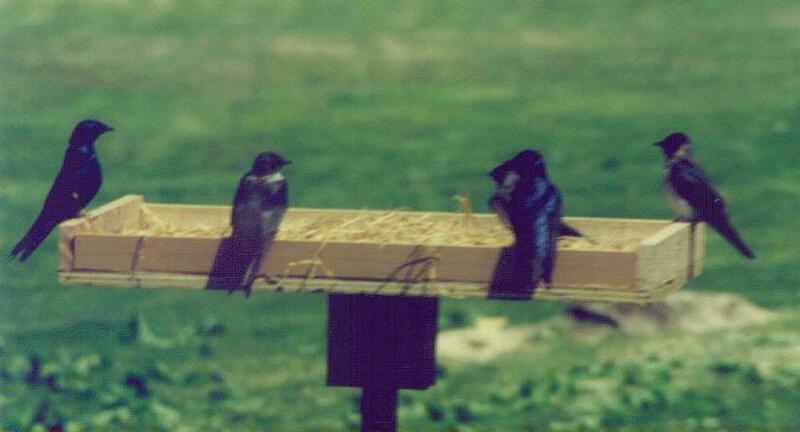 In order to maintain a purple martin colony, these two species must be controlled. Some of the means are baiting and trapping with food, using nest box traps and shooting. Trapping and relocating is not an option, they will immediately return to the nest site. Birds have very good homing abilities. Anyone that is not willing or unable to control these two pest birds should not attempt to host a purple martin colony. These pest birds do not live in harmony with any other bird species and the problem with them is quickly becoming epidemic. In many areas where these two pest birds are heavily concentrated and not controlled, the purple martin population is on the decline. It is a misconception by many people that purple martins don’t need any help during their nesting cycle. They simply put the housing up and then let nature take its course. Unfortunately, this thinking is very wrong. Usually the first thing to happen once the housing goes up is the pest birds will take over the housing. Next, they vigorously defend it to keep the martins out. If martins are already there, then they drive the martins off and usurp their cavities. From this point on, the only thing the well intended person has done is to propagate the very birds that are destroying the purple martin species. It is highly recommended by many experts that, we as landlords, get involved with our birds and become aware of what’s going on with them. The following are a few tips to help, not only for the beginner, but also the well-seasoned (but passive) landlord alike. Learn to get involved. Watch the things that are going on in your colony and make sure you understand them. I'm not saying to become totally engrossed in them, but simply pay attention to them. If something doesn't look or sound right, then by all means, investigate it and if a problem exists, then correct it immediately. Insure all housing is easily accessible by raising and lowering vertically. This can utilize a rope and pulley or winch and cable system that allows the housing to slide vertically up and down the pole for easy access. If the present housing is not capable of this, then make the changes so that it is. -NO, martins will not abandon their nests simply because you lowered their housing. -NO, it will not bother martins if you temporarily invade their nest to check things out. -NO, martins can’t smell your hands wherever you touched. -NO, martins will not abandon the chicks because you touched them. All of the above are myths passed down through time from uneducated landlords. Much more detail about doing nest checks is given below. In other words, martin housing should be monitored by the landlord. It is very important to know what’s going on in your colony, and one more thing, they are actually “fun” to do. Knowledge that something is wrong with the colony can't be detected in time to correct the problem without proper nest monitoring. "NO", as stated (and shown) above, you will NOT scare your martins away by doing nest checks. -Look to see if the nest looks normal. Does it look like a martin's nest, low profile? -Are there at least a couple of green leaves? If so, then egg laying isn't far off. -If eggs are present, do they look good, no holes pecked in them? -If young are present, do they look healthy? Do they look like they're being fed? Are there any dead ones? Although not often, unfortunately an occasional young will die and it quickly needs to be removed so that it doesn't contaminate the nest. -Check for insect pest infestation. Mites and blowflies are sometimes a major problem around martin sites. Learn how to identify them and what to do about them. A large infestation of mites or blowflies will easily kill young martin chicks or drive them prematurely from the nest. Contrary to some beliefs, martins will not mind if you temporarily invade their nests. Yes, they may fly off, but they won't go far. In fact, if you pay attention, you'll notice that they are flying right over head or have landed on a power line or some other available perching spot and are watching you. Without proper monitoring the number of eggs, nestlings, and fledglings cannot be truly determined. Without monitoring there is no way to know if predation is happening. And although it is not actually necessary, it does help to keep good records. If a nestling falls out of its compartment at a later date, it can be replaced to the proper compartment if you have good records. Nest checks should be done every 4 or 5 days (or at least each weekend) beginning with nest building and continued until the oldest fledglings are about 22 days old. After this age, a sudden disturbance of the housing could make them jump and again, this can only be known by doing detailed nest checks and keeping good, concise records. Opening the compartment at this point might panic them into attempting to fly and leave the nest, so for these last few days the housing should not be bothered and the birds should be left undisturbed. However, continue to monitor things from the ground. Daily walk-unders are a must. With good records and good timing, a few days later you may be fortunate enough to get to witness the maiden voyage of the newly designated fledglings. When all the birds are gone, the housing should be cleaned out and either taken down or closed up until the next year. Leaving the housing open and accessible would only encourage pest birds to roost in and claim ownership of them. At this time, any repairs or modifications should be done to the housing and support pole in preparation for the next season of returning purple martins. This is a very good time to make that ‘non-accessible’ housing fully ‘accessible’. It makes hosting a colony of purple martins much easier and of course, much more fun. There are two things that will work against these two insect pests. Nest changes. Nest changes are done by totally changing out the affected nests once or twice during the season. This has been determined the best method for controlling blowfly larva. To do a nest change, place the young in a temporary box with tissue paper in it. Then, the old material should be removed and burned. This gets rid of any hatching larvae. The compartment can then be swabbed down with rubbing alcohol to kill any remaining mites/blowfly eggs. New nesting material can now be added. Try using the same material originally used by the martins matching the original nest as much as possible with the depression in much the same place. Nestlings are then gently replaced. This activity should be done quickly and only on warmer days so the nestlings won't be chilled. The entire time the nest-change is taking place there is a very good chance that the landlord will be subjected to a lot of martin fussing and dive-bombing (strafing), because young are in the nest. But don’t worry about it, the adults will get used to you being there and soon light somewhere close by and watch. Then, when you finish, they will soon return to their nest. NOTE: The use of pesticides in a wild birds nest is a very controversial subject. This article is not to concur nor condemn its use, but to offer an option that is available should one wish to use it. A second thing that can be done is to add a level teaspoon of 5% Sevin dust sprinkled on the nesting material only, thru the front entrance hole. This will usually control even the worst case of mites. By sprinkling the Sevin dust thru the front entrance hole the comings and goings of the adults will spread the material around and thru the nest. In doing so, they get some on themselves, thus killing any mites that might be on them. Second, they also get a little on the young, thus killing any mites that may be on them. And thirdly, by spreading it throughout the nest, the mites/eggs in the nesting material are also killed and thus, usually within 24 hours, the mite issue is taken care of. Mites can't fly, thus, they have to crawl thru the nest and in doing so, come into contact with the Sevin dust. However; blowfly larva do not seem to be deterred at all by this material. To this date, only nest changes have shown to be affective against this pest. Diatomaceous Earth (DE) was once used and promoted by some experts, but that has since changed. Tests have shown that it does no good to use it in a martin nest for parasite control, and although some folks still think it works, personal experience has found it to be quite useless. And please note: NEVER use any kind of 'spray' insecticides in any kind of wild birds nests. These sprays are very uncontrollable and can cause harm to the birds. Martins also have 'friendly' native nesting competitors, but these competitors should be dealt with differently. The basic ones most people will have problems with are bluebirds and tree swallows. These are native cavity nesters and also have to compete with the starlings and sparrows for nesting sites. However, these birds should not be harmed in any way. These are native birds and all our native bird species are protected. If one decides to nest in your martin housing then the appropriate single-unit housing for them should be erected 50 to 100 feet or so away from the martin house. Then, close all the holes in the martin house until the suspect bird finds the new housing and sets up housekeeping. After this is accomplished, the martin housing can then be re-opened. Soft, white feathers are a big draw for Tree Swallows and will quickly get their attention, so when locating the alternate housing, if it's a TS, then sprinkle a few of the feathers on the ground under it and it'll quickly find the housing. All sorts of predators try to get at the martins and their nests and all housing should be fitted with the proper predator guards. Ground predators include, among others, raccoons, snakes, squirrels, cats, etc, and are the easiest to guard against. There are many different designs of pole guards and available information on these should be researched for the proper guards. A simple tube guard, 8 inches or more in diameter and 4' long mounted to the pole will stop most ground predation attempts. 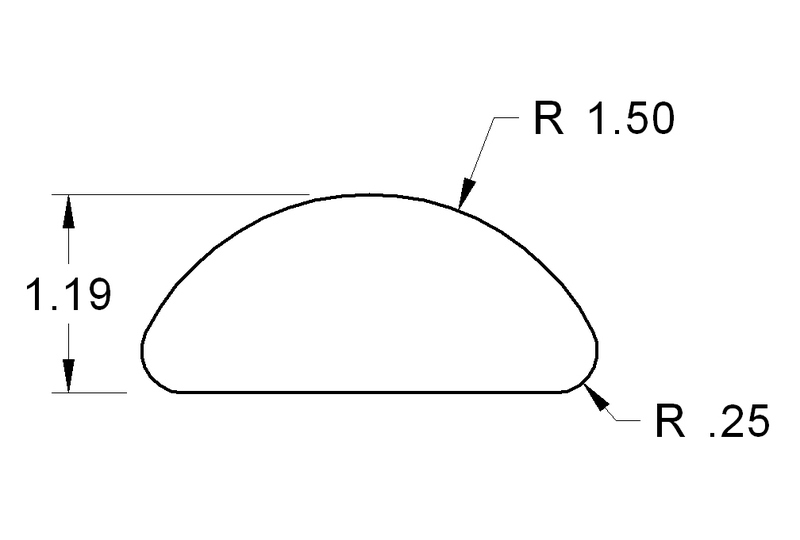 Another type of effective ground predation guard is a metal collar approximately 3' in diameter and built in the form of a cone or Chinese hat. Loosely mounting these guards at a height of around 5' or higher will work very well to protect your martins. For those that believe a snake can't climb a slippery steel pole, think again. A 4' or 5' rat snake has absolutely no problem at all climbing a steel pole. Shown here is a simple and inexpensive snake guard that works very well at preventing snakes from gaining access to your martin house. The instructions on how to make one are given here http://chuckspurplemartinpage.com/snakgard.htm PLEASE, build one and USE it. Snakes are the worst ground based predator because once they gain access into a martin house, they will simply clean it out and then disappear without the landlord even knowing they were there and leaving him/her wondering where his martins went. Snakes destroy more martin colonies than any other ground based predator. If a snake is in your martin house, the adult birds will be fluttering and screaming while flying all around it and WILL NOT land on it. IMMEDIATE action is then required by the landlord to remove the snake as quickly as possible. If not removed, the adults will abandon the site and never return. At one time or another, Accipiter hawks will discover your colony, but since they are protected, there really isn't anything that can legally be done about them other than to be present around the colony as much as possible. If they see/hear humans, they usually shy away from them. This is why open flight paths are necessary around martin housing, making it more difficult for these raptors to launch their attacks. Fledglings and immature adults are usually the ones that fall first. An adult bird, by its sheer energy and spectacular flying abilities can, and usually do, out-maneuver and out-fly these predators. Owls can be of particular concern. Great Horned and Barred Owls are huge birds and can easily destroy some martin housing. They usually come out at dusk and do the majority of their feeding at night when most landlords are asleep. Unless a colony is closely monitored a landlord might not detect that an owl is preying on the colony and it only takes a few nights for an owl to do its damage. As long as it is successful, it will keep returning, night after night, until the colony is totally wiped out. In the case of gourds, an owl will land on the rack arms and sit and listen to determine which gourds the birds are in. (Purple Martins are very noisy at night). Then it will drop down and hover in front of the target gourd as it grabs on to the entry hole with one claw. It will then beat the sides of it with it is wings, scaring the adult martins out into its waiting claws. Owl predation on houses is similar and where owls are prevalent, owl-guards are essential. Several designs are available, but the idea is to keep the owl from hovering in front of the entrance hole and again, there are a number of different designs available and the landlord should do a good amount of research to find the one that will meet his or her needs. Hosting purple martins can be a very enjoyable and gratifying hobby. It can also be a very exasperating and trying hobby. When we humans make the decision to put up housing to attract birds to our back yards, it becomes our responsibility to do it properly so that they continue to have a good, safe place to come home to. A lot has changed in the martin hobby in recent years and it’s our responsibility as landlords and caretakers of these beautiful birds to educate and inform ourselves with the latest available information and maintain homes that are not only suitable to nest in, but safe. If we humans want to continue to have purple martins around in years to come, then it’s our obligation to make the changes necessary to enable the purple martin to continue to propagate and be part of our native bird species. Might I also add, if one is not willing nor able to intervene in the nesting attempts of European Starlings and English House Sparrows in purple martin housing by eliminating them, then they would be best served finding another hobby. These two pest bird species are slowly eradicating our own native cavity nesting bird species and must be controlled and since man intervened in the natural order of things by bringing them here, then we must again intervene to correct the problem by eliminating them. The information given above about purple martins was compiled from a number of different sources too numerous to mention here. It's intent is to consolidate generally known information, the latest research data and personal experience into one article and get the average purple martin enthusiast or potential purple martin landlord curious enough to search out more information about them so that they become fully aware and begin to become educated about this species and both the obstacles, and the pleasures they will run into ' before' undertaking the hosting of purple martins.